Flow rate of over 300 l/sec experienced when capping open loop ground source boreholes for system for Lincolnshire Herbs. The Eaton Place property had an Open Loop cooling scheme installed back in 2004. GSC was contacted by McDonald and Partners who wanted an experienced view of the current system and help to rectify some problematic issues. GSC director Iain Howley said “Angus [McDonald] told us that the client had paid for an open loop cooling system and it was not delivering the required results”. GSC investigated the system thoroughly and concluded that the abstraction well was functioning normally but the discharge point became impractical. There was no other area accessible to sink a new return well and diverting spent water into a Thames Water drain is a waste of a natural resource and hugely costly. GSC had to come up with a better solution. GSC looked into the possibility of abstracting and recharging water using the same well whilst avoiding thermal interference and therefore maintaining a level of sustainability. Drawing on over 60 years of family experience in well drilling, Iain and his co-director Andy Howley came up with a way forward. They had previously used inflatable packers to test pump different horizons within a well to assess differing geochemistry for bottled mineral water producers, the potential was there to use a packer to introduce a barrier within this well. First of all, GSC needed to fully understand the fracture characteristics of the open section of Chalk within the well. 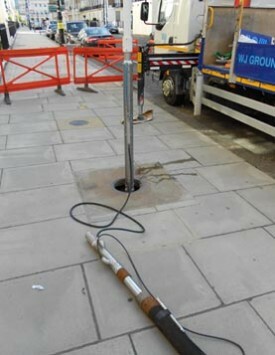 They employed European Geophysical Services Ltd to undertake a full CCTV and Geophysical log of the well. This survey identified the size and position of the fractures and determined that there was an 8m ‘solid’ (unfractured) chalk zone to exploit. A submersible pump unit could be placed below the packer and the discharge pipe placed just below the static water level some 30m above the packer and water would hopefully disperse laterally along the fractures. GSC selected one of their regular partners WJ Groundwater and hydrogeologist Dr. Marc Bevan to test and finalise their design. A contingency plan of a motorized valve to direct spent water to drain was incorporated into the design so water could be diverted if any significant thermal interference within the well did occur. The client gave the go ahead and dialogue with the local EA officer was opened. Iain said “GSC was dealing with a unique situation and our close relationship with the EA helped enormously with progression of our plans”. It was agreed by all parties to run the system for a season, all operational data would be logged and a full review would follow. 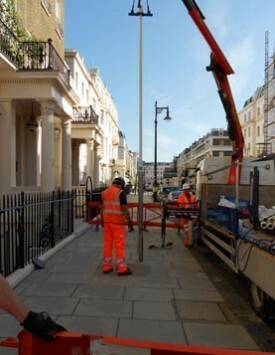 WJG installed the system which was switched on in April 2013. By July 2013 temperatures in the capital were hitting 30+°C for weeks on end providing the ultimate test for the GSC design. Iain said “The results were excellent, we are extremely pleased to report that the system has exceeded all hopes and expectations. The abstraction temperature has remained at 13.4°C whilst discharging spent water at 19.7°C. The spent water is not mixing at all, even after the unusually hot conditions. GSC is proud to have designed and installed this system with WJG. Needless to say the client and his team are extremely pleased with the results.